Many enjoy the sounds of a wood burning fire and crackling. Now you can get that experience in your fireplace with the Real Fyre Crackler with Pine Cone Cover. 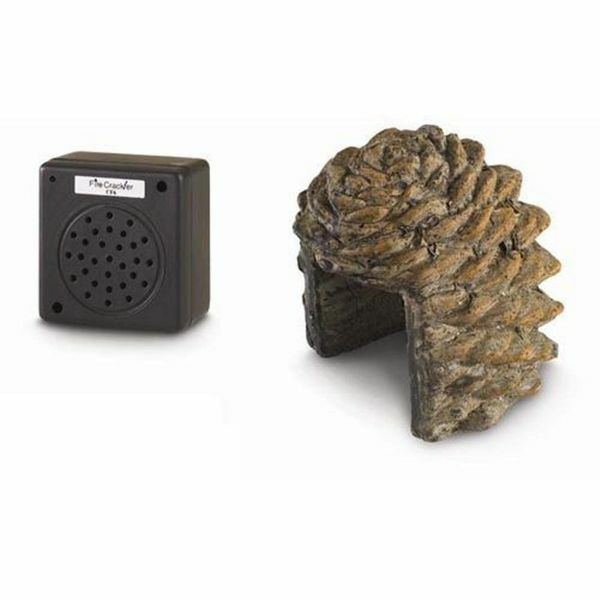 It will sound like a real wood burning fire coming from this speaker encased in a natural-looking pine cone cover. With a low, medium, and high setting, you can have as much or as little popping and crackling with just the push of a button. Enhance the sounds of your fire with this ingenious product from Real Fyre. How big is the pine cone? The bigger it gets the phonier it starts to look I would think. The pine cone is about 6" tall. Does it take batteries? How long will they last? This item uses 4 AA batteries for operation. While the brand of batteries and the amount of time they are in the Crackler plays a part, you can expect to get 30 to 36 hours of operation out of the batteries. Is this battery powered? Will it work for an electric fireplace insert? This crackler is indeed a battery powered product. In can be placed discreetly near any gas or electric fireplace to add realism. Can you tell me exactly where and how the crackler is to be placed? How far from the burning gas logs? This crackler is ideally placed upon the hearth, directly to the side of the fireplace opening. Unless you have a good deal of excess fireplace depth (12 or more inches), the crackler should not be placed directly inside the fireplace opening, as it can overheat. Can this go in a gas fireplace without melting? How many feet from the fireplace can you hear the sound? This accessory is designed to sit on the hearth of your fireplace, outside of the firebox. It is not rated for use in the fireplace. This module has both a high and low volume setting. The sound should carry across a standard living room. Great addition to a gas fireplace to mimic sound of a real fire burning. Soundtrack should be longer but otherwise it sounds like a real fire burning. ProsIt has the sound of a real burning fireplace including crackling wood sounds. ConsSoundtrack should be 15-minutes or more of a real fire burning with crackling sounds so you don't recognize the repeating sound track so fast.